The women in Pamantingan village are among the millions of Filipino women who moved to cities and other countries to find jobs, leaving their families behind, March 20, 2018. When the rains failed in 2015 and drought gripped southern Mindanao in the Philippines, Corazon Vegafria knew what she had to do: move to the city of Koronadal, about an hour away by bus, and find work as a domestic helper to support her family. Her husband looked after the children while Vegafria sent home most of the 2,000 pesos ($38) she earned every month cooking and cleaning at her employer's home. "We had no choice — we needed the money, and I could easily find a job in the city," she said. Six months later, she returned home "when the situation improved." In the past two decades, the Philippines has emerged as one of the world's leading source countries for migrant workers, particularly as more powerful typhoons and other harsh weather make life at home harder. More than 10 million Filipinos currently work abroad, according to the Philippine Statistics Authority. But in the last few years, the gender balance has shifted, with about 55 percent of overseas workers now women, its data shows. That makes the Philippines an outlier in a world where most migrant workers are men. Globally, migration is growing, especially among families hit by disasters, conflict or weather shifts — and that growth does not always adhere to traditional patterns. In some places, seasonal migration is slowly leading to permanent relocation. In others, migrants are heading to new destinations. In the Philippines, one of the biggest changes is that migration is gradually taking on a female face. Each day, hundreds of rural women pack their bags for jobs as maids and care-givers, largely in the Middle East and the United States. Others go to Singapore and Hong Kong. Thousands of women also flock to Philippine cities including Manila, Davao and Koronadal, where they work as domestic helpers or in malls and restaurants, sending money home to pay for their children's schooling or to invest in farms their husbands tend. "Migration is linked to low agricultural productivity, natural disasters such as droughts and typhoons, failed deals to secure land rights, and conflicts," said Alvin Chandra, a research fellow at the University of Queensland in Australia. "Increasingly, it is a coping strategy for young women to diversify family income and overcome poverty," said Chandra, who has studied migration in Mindanao, where an armed conflict has raged for decades. Across Southeast Asia, people are migrating in rising numbers, with the wealthier countries of Singapore, Malaysia and Thailand the top destinations, according to the World Bank. Singapore's average monthly wage is more than 30 times that of Cambodia, while Malaysia's is triple that of Indonesia and the Philippines, it said. Migration plays an outsize role in the Philippines' economy, where remittances from overseas workers make up about a 10th of gross domestic product - the highest share in the region. Women are leaving home in greater numbers, as they can get long-term jobs more easily. Men, by comparison, usually land short-term, seasonal work. Some migrants, like Vegafria, move for a few months at a time to get their families through a lean period. But many end up staying on, as a cycle of frequent storms and drought makes it harder to live off the land. Elisabeth Pacaldo, one of millions of Filipino women who have moved to cities and other countries to find jobs, poses for a picture at her employer's office in Manila, Philippines, March 15, 2018. Elisabeth Pacaldo, for instance, moved to Manila in 2002 to work as a nanny after income from fishing and farming fell in the Visayas region where she came from. Her husband stayed behind to care for their five children. After four years, Pacaldo, now 55, was able to send for three of her kids. Her husband moved to Manila in 2008 to work as a driver. "It's easier for women to find work in the city, and the salaries are higher. I can't go back," said Pacaldo, who now works as an administrative assistant in a non-profit. Worsening extreme weather is an important driver of migration in rural parts of the Philippines, a country seen by experts as highly vulnerable to climate change. "There are some climate impacts where adaptation and risk reduction efforts are no longer a feasible option. People have to make extreme choices, and migration is one of them," Chandra said. The Philippines and other developing nations must acknowledge migration as one way of coping, and develop "a comprehensive strategy that ensures the safety and dignity of their most vulnerable people," he told the Thomson Reuters Foundation. The Philippines has a well-established system for workers looking to move overseas: the government lists job opportunities and offers orientation courses. Recruitment agents operating in the country must attend a seminar before getting a license, and a refresher course when renewing. But there is little support for - or data on - the millions of women who move inside the country, a group at risk of abuse and low wages, according to Gabriela, a rights group based in Manila that records cases of abuse. 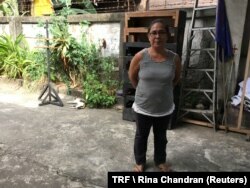 There have also been complaints about the treatment of Filipino maids overseas. President Rodrigo Duterte earlier this year banned workers from going to Kuwait following the discovery of the body of a Filipino worker in a freezer. Earlier this month, the two countries reached an agreement regulating conditions for domestic workers. Last year, Indonesia agreed to continue sending domestic helpers overseas, after temporarily banning them from going to 21 Middle Eastern countries following cases of abuse. The benefits of migration are undeniable for most Filipino families - and for the country's economy. "Even members of the household who do not migrate benefit from remittances that boost budgets and reduce poverty," the World Bank said in an October report. "In the Philippines, households that are able to send a member abroad have two-fold or three-fold greater odds of escaping poverty," it added. Filipinos overseas sent home a record $28 billion in cash remittances last year, money that helped fuel spending and sustain expansion in one of the world's fast-growing economies. But the movement of women is also having an unhappier impact on households in a country where men have long been the main earners, and often had a bigger say in the family. "With the migration of women, there is a shift in community values, lifestyles and gender relations that has led to greater domestic conflicts and violence," Chandra said. "With women being away, their right to participate in community life and decision-making is challenged. They are also vulnerable to abuse and trafficking," he said. President Duterte has said his long-term aim is to slow the exodus of workers by boosting the domestic economy and creating jobs that provide sufficient income. In Sultan Kudarat district in Mindanao, some migrants are finding ways to return home — and stay. When Geneline Castillo, 47, got back after working seven years as a domestic helper in the Middle East, she joined a cooperative that trains farmers in organic growing methods. She now cultivates rice and vegetables on the 2-hectare plot she and her husband lease, and has bought a motorbike for trips to the market. "It's better here with the family, and I now have a livelihood option, even if the money is less," she said. "But my daughter has gone to Dubai to work. I could not stop her - there is nothing for her here," she said.